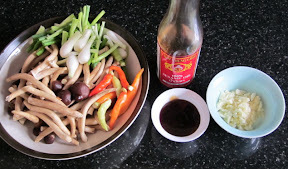 This is how I try to cook the mushroom in the healthy way: not too salty, not too fat, and not too spicy. Adding the whole chili without breaking them mean you can share this dish with a child. If you feel like eating a bit spicy you can take a bite to the chili. 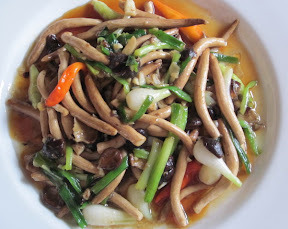 This is pure vegetarian dish because I use the mushroom vegetarian sauce instead of Oyster sauce. It’s very simple, fast and taste good. This dish is made for my father who needs to control his blood pressure. Add the Mushroom sauce on the fresh ingredient plate. Fry Garlic in Vegetable oil with medium heat until the garlic turns light brown. Throw in the fresh ingredients and fry with high heat for a few minutes. Top with Sesame Oil before serving. Serve with hot steam rice.